GoodBerry partner IFAPA hosted a technical workshop in Huelva with 70 participants from the strawberry industry (growers, technical staff, breeders), but also research and local authorities. 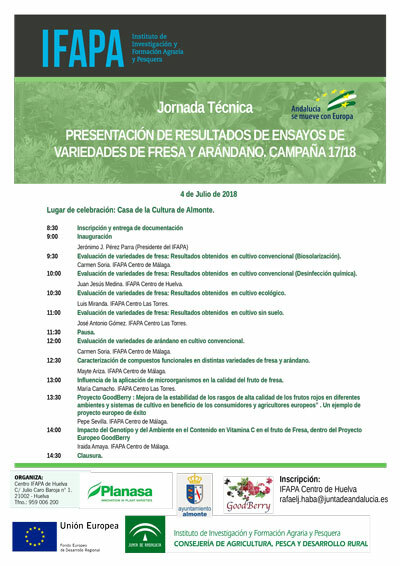 The workshop was presided by the mayor of Almonte and the local representative of agriculture of Huelva, while the sessions were introduced by the president of IFAPA, Jeronimo Pérez Parra. The program, included two talks related to GoodBerry: one overall presentation of the project and one presentation disseminating initial results on the effects of genotype and environment on vitamin C content in strawberry fruit using the mapping population ‘Candonga’ x ‘Senga Sengana’. There was a great interest in the data presented from the technical trials and in the GoodBerry project with references to the workshop being made in local radio and press.